We always wanted to travel through the hill country of Samaria (Manasseh and Ephraim) on our tours, but there were many years that this was not possible due to the political situation. When travel was possible we drove (from the north) through Jenin, the plain of Dothan, Samaria, Shechem (Mounts Ebal and Gerizim, Jacob’s Well), and other sites as time permitted. If we could not travel along the central mountain range we drove through the Jordan Valley. 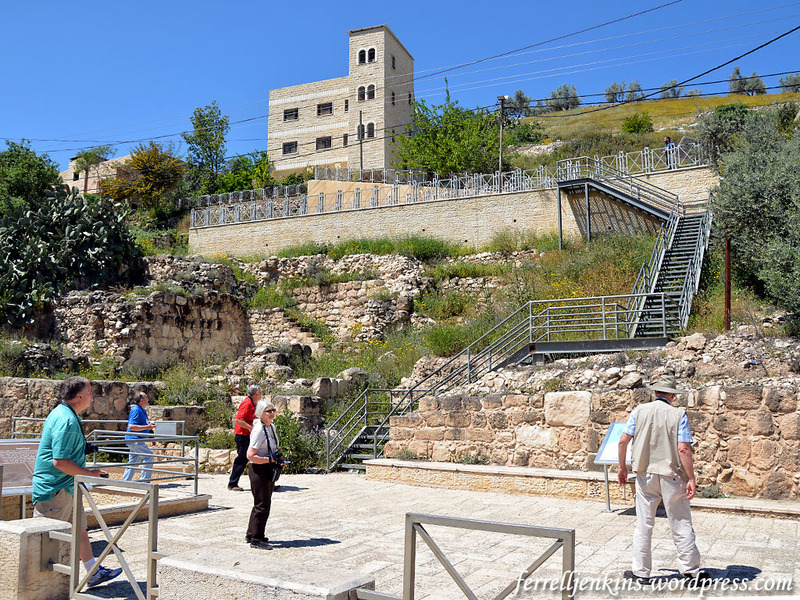 Sometime when traveling through Jenin, our guide would mention that there is a tel (tell, archaeological mound) on the south side of the city, but we never saw it. Traveling in a bus normally provides a better view because one is sitting higher, but I now understand why we did not see this tel. The excavation report explains that the spring entrance at road level became visible only after the 1996-1997 road work. The road runs through the Wadi Bal’ama. The site on the south side of Jenin is known as Khirbet Bal’ama, or Khirbet Belameh. Several 19th and 20th century archaeologists identified this site with Biblical Ibleam. Thutmose III was the ruler of Egypt (1504-1450 B.C.) during the 18th Dynasty. Some scholars place the beginning of his rule at 1490 and others at 1479. 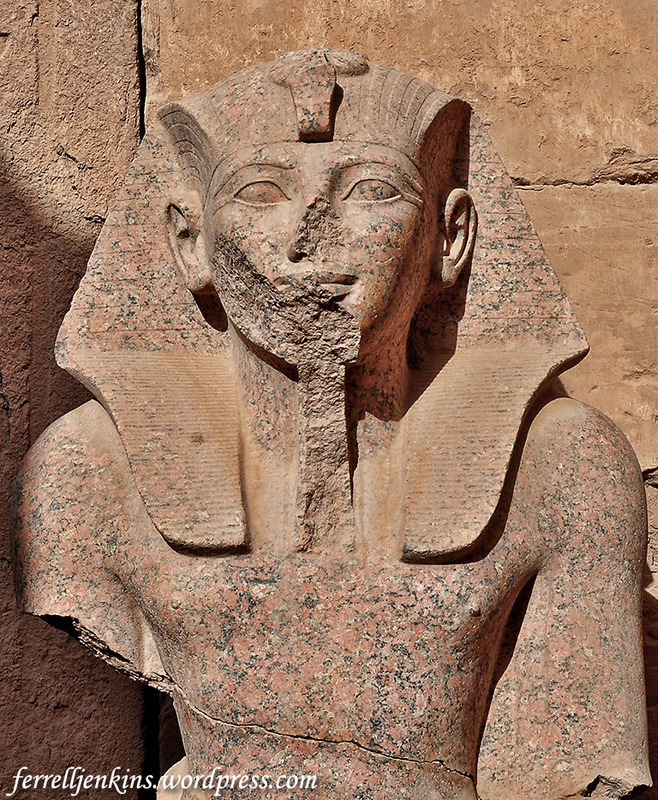 Seated statue of Thutmose III at the Karnak Temple. Photo by Ferrell Jenkins. Thutmose made a military excursion into Canaan and left a record of it on the walls of the Karnak Temple. Our photo shows a few of the bound rulers of various cities. I don’t have a translation of the cartouches and do not know if Bal’ama is shown in this photo, but it is included somewhere on the walls of Karnak. 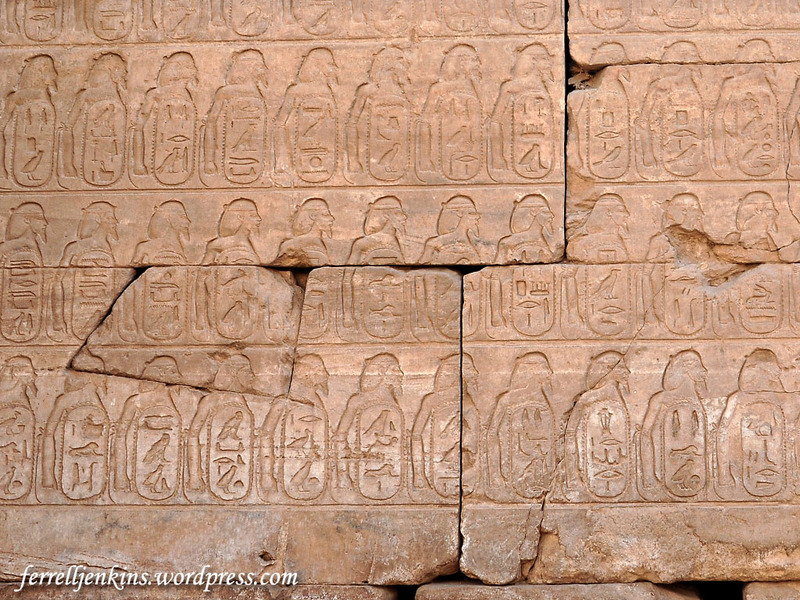 Part of the city list left by Thutmose III at Karnak Temple. Photo by Ferrell Jenkins. My interest in Bal’ama was renewed when I read A.D. Riddle’s article in the Bible Places Blog here. Last April, 2016, I had this site in mind when we were able to drive through the West Bank from Galilee to Jerusalem. As we drove south of Jenin I caught a glimpse of the new sign marking the entrance to Bal’ama Tunnel. Note that the sign is in Arabic and English. I may be wrong, but I don’t think this sign was there in 2015 when I drove through Jenin, but I may have been looking to the east of the highway. 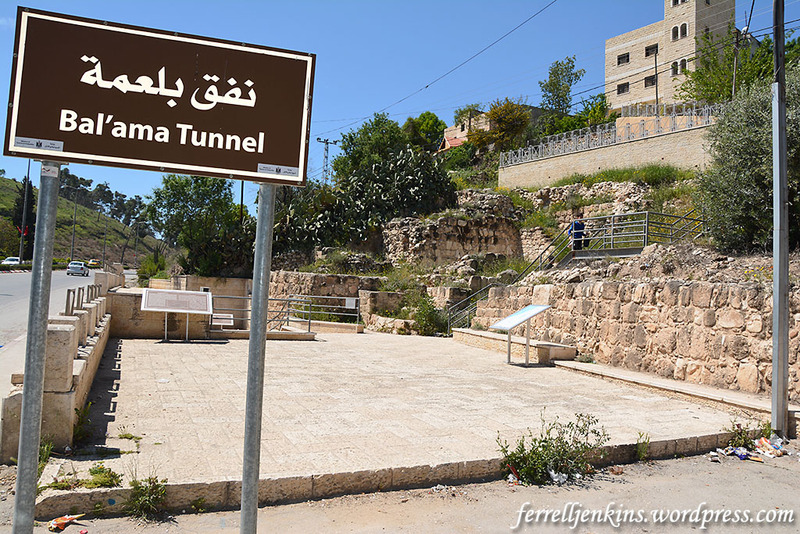 Bal’ama is marked as Bal’ama Tunnel on the west side of the road from Jenin to Dothan, Samaria, and Nablus (Shechem). Photo by Ferrell Jenkins. Khirbet Bal’ama is a Canaanite fortified city that occupied a strategic position controlling the historic route of Wadi Bal’ama which connects the Arraba Plain with Marj Ibn Amer (“Jarzeel [Jezreel] Valley”). In the ancient record, the site is identified with the name “Ibleam“, and was mentioned in the Egyptian Royal Archive in the 15th century B.C. With reference to the classical records, Bal’ama was known as “Belemoth”, and was mentioned as a major town during the Bronze Age and beginnings of the Iron Age. It was inhabited during the Persian, Hellenistic, Roman, Byzantine, Early Islamic periods, also during the crusader/Ayyubid, Mamluk and Ottoman periods. Excavations at the site carried out by a Joint Palestinian-Dutch team between 1998 and 2000, revealed the water system and parts of a city walls dating back to the Bronze Age at the western perimeter of the site, ruins for houses dating back to the second Iron Age, a winery from the Roman period and remnants of a tower on top of the hill dating back to the crusader/Ayyubid and Mamluk periods. A cemetery on the southern top of the hill adjacent to Khirbet Bal’ama was discovered as well. Khirbet Bal’ama is visible to the right of the new building on the slope. There are two entrances to the tunnel; one at street level and another at the level of the platform on the slope. The site of Khirbet Bal’ama south of Jenin. Photo by Ferrell Jenkins. Riddle includes some nice photos of the site, but we can add one with the entrance to the tunnel system open. Entrance to the tunnel at Khirbet Bal’ama. Photo by Ferrell Jenkins. Another sign on the entrance plaza describes the water tunnel system. The water tunnel is located at the eastern foot of Khirbet Bal’ama. It was first described by Victor Guerin in 1874 and then by G. Schumacher [who had earlier excavated at Megiddo] in 1910. The rock-cut tunnel was dug to give access to the water source at the foot of the hill. It was designed primarily to be used in times of war and siege. The Bal’ama water tunnel system is one of the major systems in Palestine, like other systems found in Jerusalem, Tel el-Muteselim (Megiddo), Tel el-Qadah (Hazor) and Tell el-Jazari (Gezer). The tunnel consists of three parts, namely the archway at the lowest entrance, the rock-cut tunnel going upward to the west, and the upper stone-built narrow passage. The discovered tunnel is 115 metres in length; 105 metres of it is rock-cut and includes 57 stairs. Archaeological objects were found, such as pottery vessels, glass objects, coins, and some inscriptions. Beginning of the Bal’ama Tunnel on the eastern (northeast, Riddle) side of the city. Photo by Ferrell Jenkins. 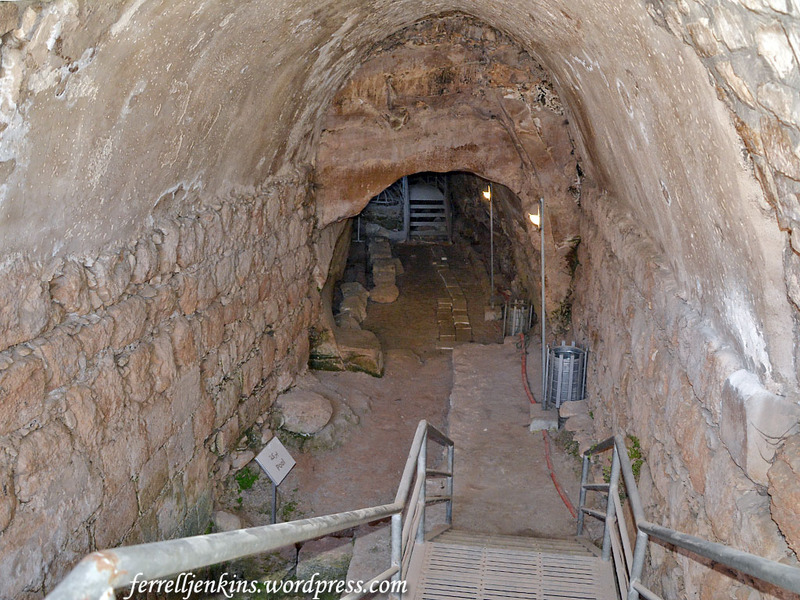 Due to lunch plans at Samaria and other sites on our schedule for the day we were not able to walk through the tunnel. Always a reason to return. Riddle cites two excavation reports. He says the first may be difficult to access in the United States, but I am pleased to say that both documents are now available on Academia under the name of Hamdan Taha. This is for those who have a more technical interest in the site. Taha, Hamdan and Gerrit van der Kooij. The Water Tunnel System at Khirbet Bal’ama. Archaeological Project Report of the 1996–2000 Excavations and Surveys, volume II. Ramallah: Ministry of Tourism and Antiquities, Department of Antiquities and Cultural Heritage. 2007. Taha, Hamdan. “Excavation of the Water Tunnel at Khirbet Belameh, 1996-1997.” in Proceedings of the First International Congress on the Archaeology of the Ancient Near East, Rome, May 18th-23rd 1998. 2000: 1587-1613. 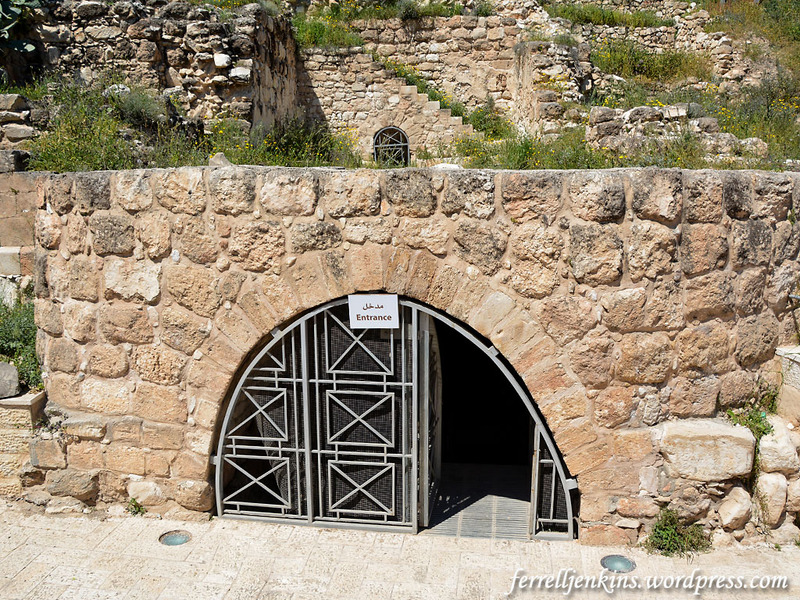 This entry was posted in Archaeology, Bible Places, Bible Study, Church History, Egypt, Israel, Old Testament, Photography, Travel and tagged Palestine, Palestinian Authority. Bookmark the permalink. I recognize some of these tourists. Very informative and helpful post! Thank you!! Interestingly, it seems the information signage avoids mentioning Israel as former inhabitants.